2016 Miami international Boat show tease! 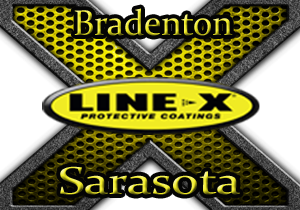 We will have four boats showcasing our LINE-X Protective Coatings Ultra material on their aluminum! A Carbon Barker 26 is getting a Seven Marine 627 and receiving White Line-X Ultra! Beavertail is launching a new 20 stepped hull featuring a yet to be seen Mercury Pro XS 115 Four Stroke outboard with Black Line-X Ultra! Evinrude will have the Offshore Apparel Yellowfin 34 with White Line-X Ultra will be in the water running demo’s. And a Freeman 34 VH featuring Black Line-X Ultra will also be in the waterIf your interested just give us a call or message and we will be happy to steer you in the right direction! We will be at the show trying to be around most of the boats to answer questions. We look forward to seeing members as we would not be here without your continued support!